Over the years, your Bernalwood editor has gradually received an eye-opening education in the challenges faced by many of our neighborhood merchants. Never mind higher-level stuff like marketing, advertising, parking, margins, and worrying about tectonic shifts in the retail environment triggered by ecommerce and Amazon. No, the matters that impress us most are the day-to-day issues that arise from the fact that when you operate a storefront, you are quite literally opening up your front door to anyone who decides to walk through it — for better or for worse. We have/had a beautiful raven piece that sells for $650. We have sold two over the years. They are one-of-a-kind and the artist does not always make the raven, but recently we got it in again! And then the other day I noticed it was gone. I had just done a display with it, so I knew it had been stolen very recently. It is big (18″ long) and a focal point in the store. Then I started counting the other hand carved birds that are by the same person. We are missing 5 altogether, which adds up to $2,000 in sales. This part of retail is pretty tough – and I have taken it hard. Part of store ownership is being in denial about theft — if not, one would be constantly worried and or paranoid. That said, one must also be prudent. I will have security cameras installed. Blchhh. On that last note… Darcy tells Bernalwood she seeks recommendations for a good security camera installation and service provider. Not just a camera, she says; she hopes to find someone who will install and support a new security camera system. So if you have any recommendations, you know where to find her…. as always, the front door at Heartfelt is wide open during normal business hours. 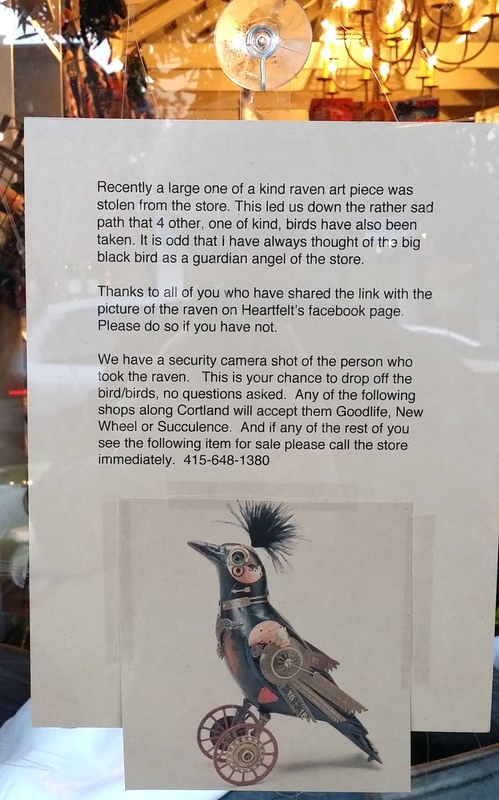 HEARTFELT is a wonderful store run by an excellent neighbor, and this kind of theft is just sad. All I can say is that I’ll keep an eye out for the missing birds and our neighbor is not discouraged. I’ll wave at the security cams next time I am in buying gifts or cards knowing that they are a necessity in this day and age. If she has a security image of the thief can you post it here? Blecch. Sorry to hear it, Darcy, and I hope your birds are returned. Post the picture of the person who stole the raven! who steals art!?!? who steals from small businesses? sorry, neighbor darcy. Those “steampunk bird” scupltures are incredible. I bought one last year for my wife’s birthday. It’s a shame about the thefts. They’re so intricate and made with so many antique parts it’s hard to imagine how long they take to make. Darcy here, thanks all for your kind words after reviewing the security camera shots from the Good Life we did not find a clear shot of the person. I was really hopeful because the raven is so large. 😦 We will install a system before the holidays. Bummer 😦 Sorry to hear about the loss. A friend of mine uses Dropcam and has been really happy with it. Apparently they will also host the videos in the Cloud, so you don’t need to worry about setting up a DVR or anything. Seems like a good service. Good luck! This really stinks. I love your store, and rely on it for most gifts. In addition, you have been a good neighbor to the neighborhood, so . . . well, I already said: it stinks! I hope there is a happy ending! They’ve stolen *5* of the birds?? And it was just noticed? Perhaps instead of announcing it to the world, they should have set up a “sting” to try and catch the culprit. 5 of the same kind stolen suggests an inside job. Someone with a steampunk fetish, probably taking them for themselves. I might show up unannounced at some employee homes in this circumstance. The housemates probably know they’re there but they were told they were purchased legitimately. Are RFID tag systems effective? Affordable? Everyone seems to have security cameras nowadays, but do they ever result in successful criminal prosecution? Just asking in a “return on investment” kind of way. SECURITY CAMERAS — For the record, I install and maintain Internet-connected security cameras. My recent clients include the Atlas Cafe, 20th & Alabama (4 cameras), and the Littlest Angel preschool on Church Street (9 cameras). I also have good Yelp and Angie’s List recommendations under Honest Dave. Darcy, so sorry to hear about your birds. What a shameful thing to do. Hope you catch him / her / them!